It’s one thing to have the motivation and discipline to improve as a triathlete by going out and doing all sorts of great workouts. Putting them together in a smart way is a different kettle of fish. Whether you’re training for a sprint triathlon, Olympic distance, or a half or full Ironman, the actual workouts in your calendar is just the tip of the iceberg that rests on a foundation of these six fundamental and scientifically proven triathlon training principles. In terms of training, stress means that a carefully and selectively applied workload on your body is needed to elicit positive adaptations in the system under stress. The way you apply stress should depend on the adaptations you are looking for. Selectively applied means that first and foremost you have to stress the right systems. If you need to improve you’re aerobic endurance, then going out and doing heaps of anaerobic intervals is not going to do you much good. Carefully applied means that you also have to consider the amount of stress applied. Your body and physiological systems are only able to adapt so much at a time. So it’s completely unnecessary to do something that is far beyond what your current capacity is, since this won’t result in any more improvement than a smaller overload just a bit beyond your current capacity. As an example, don’t do a 6 hour ride if the longest you’ve ever done before is 3 hours. Build up incrementally over a longer period of time, and you’ll get all the benefits but minimize risks of injury and over-training. The adaptations we discussed above happen mostly when you’re recovering between workouts. This obviously includes sleep (do you get enough? ), but also all your other daily activities. If you have a day job where you are very physically active, your daily recovery is not as complete as at sedentary desk jobs, and you need to consider this in your training. Recovery on a slightly bigger scale is the recovery that is needed between training blocks. Typically this takes the shape of rest weeks. How often rest weeks are needed and how scaled back they are depends on the individual, age, fitness level and intensity of the previous blocks. During periods of intense training you would probably want to schedule recovery weeks at least every fourth week. Also, recovery is necessary between training periods. In other words, you need an off-season. When you’re done with racing for the year, make sure to take some time off structured training to recharge your physical and mental batteries. Also, if you have a very long racing season, you may want to consider a shorter off-season in the middle, for example right after your first A-race if you have two on the calendar. Finally, recovery of a different type is needed during workouts. The purpose of this recovery is different in that you’re not after any physiological adaptions in these periods lasting in the order of just seconds to minutes. Rather, they allow you to perform a larger total amount of work at high intensity, so you can maximize the improvements you gain during the actual recovery after the workout. You’ll hear it time and time again, but consistency really is key in endurance sports. It is scientifically proven that you detrain faster than you can rebuild that fitness, which means that you obviously want to avoid detraining. There are some exceptions, since you are going to detrain during recovery periods after races and during off-season, but that’s completely fine. You just want to minimize it and control it. The good news is that you can maintain fitness really well with a moderate amount of maintenance. A little goes a long way. The higher your fitness levels, the more maintenance you’ll have to do to avoid detraining though. Finally, the number one nemesis of consistency is injury. You want to avoid injury at all costs! If this means skipping a couple of hours of training a week to do preventive work such as strength and conditioning (this is a must-have in your plan anyway! ), get a massage or do some foam-rolling and stretching, it is well worth it. Closely related to the principle of stress is progression. Since you will adapt to the stresses you apply in training, you need to make sure that you incorporate a progressive overload to continuously make improvements, or else you will reach a plateau that can be hard to break through. Progressive overload comes in multiple shapes and forms, but in short, consists ofmodulating the frequency, duration or intensity of your workouts, or any combination thereof. Another thing that comes into play is the law of diminishing returns. The more fit you get, the less you will improve for any given stress, even if these stresses are relative to your current capacity. Consequentially, for beginner triathletes it is not recommended to modulate more than one of the parameters mentioned above, as they will still get the improvements they look for, but will minimize the risk of injury and overtraining. For very advanced triathletes however, it becomes a game of risk-reward, where a much larger progressive overloads are needed, even though this comes with some risks. To explain what this means in practice, think about how you would train for a long cycling tour compared to for a 20 km time-trial. You would use different energy systems, with the tour being aerobic and your body would need to use fat as an energy source, and the short and intense TT would tap into your anaerobic system. You would use (slightly) different muscle groups and movement patterns, assuming you’re on a road bike in the tour and on a TT-bike in the TT. And external variables such as terrain (hilly vs. flat, altitude or sea-level, time of day etc.) could be very different as well, and to maximize performance you need to consider this in your training. The sixth principle is actually a function of the other principles. By that I mean that if you follow the five other principles, the result will be periodized training. For example, recovery between training periods, as stated previously, in practice typically means the off-season period. The principle of progression means that you build upon your fitness incrementally, so off-season goes to base goes to build, and voilà, different training periods. The specificity principle is related to the peak period, where you really try to simulate race day, and so on. Three key concepts in periodization is the microcycle, mesocycle and macrocycle. For most, a microcycle is a week in length, although it may be worthwhile to consider other microcycle lengths if you find that weekly cycles don’t work for you, for example because of the frequency of hard workouts or special work schedules. A mesocycle, or a block, consists of several microcycles. Definitions can vary, but typically examples of mesocycles are the base period, build period, peak period and so on. Some consider a mesocycle be the block of microcycles from one recovery cycle to the next, so for example a four week block, if you have recovery weeks every fourth week. A macrocycle is the entire year for most age-groupers, although elites may choose to align the macrocycle with the four-year Olympic-cycle. 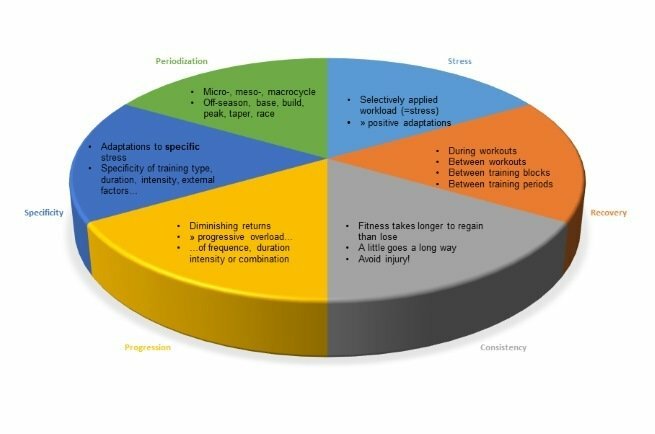 This way of periodizing a year is applicable for most triathletes although the duration and content of each period depends on the athlete, goal races, base fitness level etc. Also, if an athlete has a very long season with several A-races, periodization becomes more difficult and getting it right requires considerable experience. As an example, if your base fitness is very high year round, you typically won’t need as long a build of increasing workloads as if your base fitness has slipped a lot during the off-season. Instead, you can spend more time in the peak period trying to really nail peak fitness for your upcoming race. Do you follow these principles of triathlon training? If you don’t follow some of them, why? Do you intend to after reading this article? Do you want some specific principle explained in more detail? Post your comments and questions below. Also, don’t forget to share, and check out the related blog posts for more great triathlon stuff. Thank you for reading!